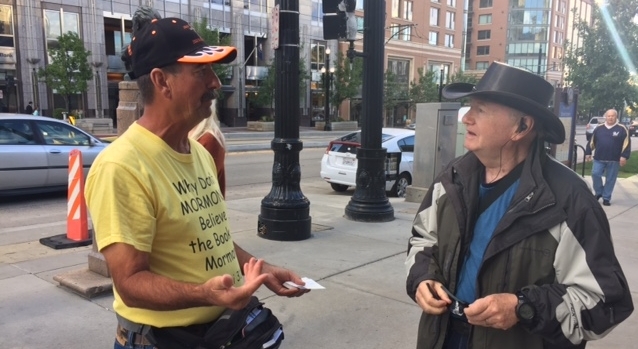 The weather was perfect for evangelism at this year’s LDS General Fall Conference and when the weather is comfortable it seems to invite more people into conversations. This is exactly the way the conference weekend went. 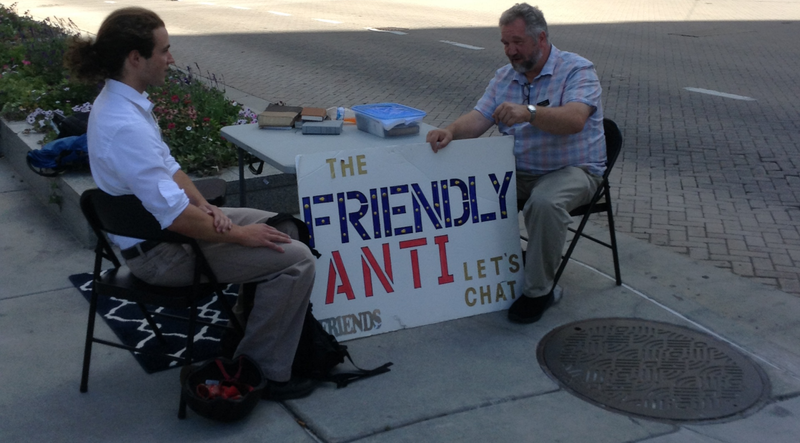 The “Friendly Anti” table was again a popular choice for the LDS to stop, sit down and engage in topics about the nature of God, the Gospel, Joseph Smith’s false teachings and, of course, the lds.org “Gospel Topic Essays” on Joseph Smith’s 40 wives. 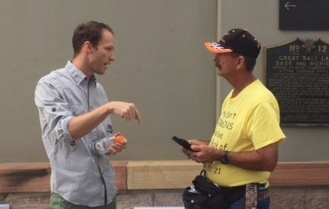 Doug was not able to make the conference so Jeff stood in his place and held his sign “ Is the Mormon Jesus the Same Jesus of the Bible?” while Bob, from Washington, manned the Friendly Anti table. Brian and Bob from Washington had a couple of signs leaning against a wall near me and one of the signs read “Joseph Smith had 34 wives, a prophet or pervert?” Well, it didn’t take long before an angry elderly man can up to Jeff, who was standing next to me, and stated that Joseph Smith was a prophet and asked Jeff if he knew why Joseph Smith married all those women. The angry elderly man said there was no evidence of anyone of these woman having children by Joseph Smith. 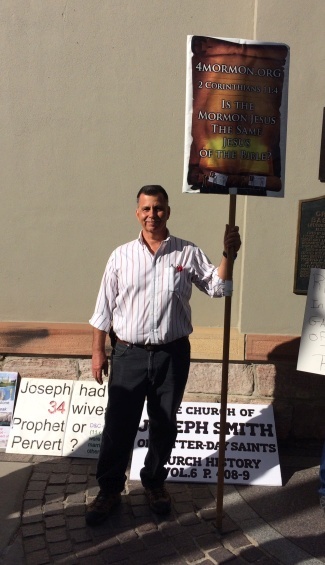 I asked him, “If the reason Joseph Smith married all these women was so he could call them out of the grave, why was it necessary to marry 11 of those women that were currently married to their living husbands? Why couldn’t their living husbands call them from the grave?” Without answering, the angry elderly man stomped off. 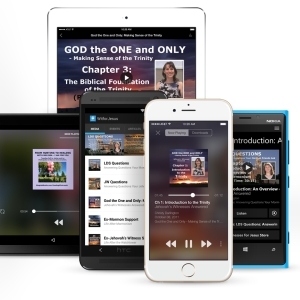 Noel agreed that exaltation was needed to become a God like Heaven Father. I said, “Then how could Jesus become a God when he had not yet received a physical body to progress to exaltation and then become a God?” I continued by explaining, “According to the LDS Church, Jesus (who is Jehovah God in the Old Testament) was only a spirit without flesh and bones because he had not yet been born into a physical body so wouldn’t that make it impossible for Jesus to obtain God hood?,” I asked. Noel had no answer to this so he simply stated that he knows the church is true and then said he would be back later to talk some more. Later he returned, but all he said was that he has a testimony that the church is true and then he left. 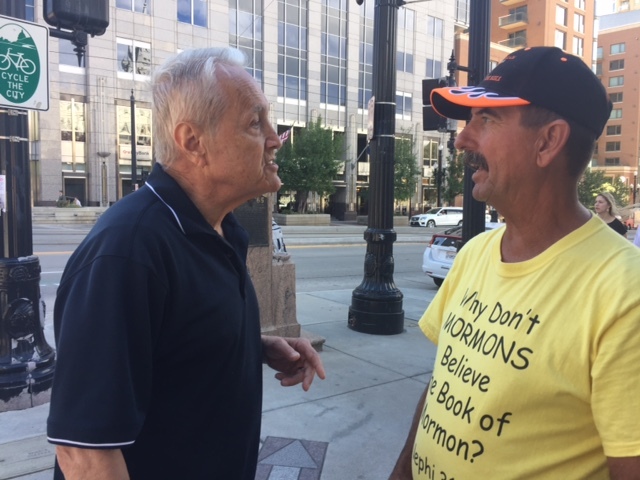 Later, I had an ex-LDS man named Dave approach me about my shirt, “Why Don’t Mormons Believe the Book of Mormon?” I briefly explained that the Book of Mormon has a lot of biblical precepts that the LDS Church denies. He then confided in me that he left the LDS Church because of their lies and says he is pretty much an atheist at this point in time. He went on to say that he has been attending a Christian church with his friend but is having a hard time believing the whole concept of free grace. I asked him if he had stopped believing there is a God or is it just the religious aspect of the whole situation. He replied that he was confused about the idea of God and who He is suppose to be and was turned off completely with religion because of the people. I explained to Dave that God isn’t about religion but about relationships, that religious organizations are made up of people that are not perfect. I asked Dave to tell me about what he was having a hard time understanding at the Christian church he attended with his friend. He explained that the idea of saying that people are saved but they still sin and that faith in Jesus is all one needs to be saved is hard for him to accept. In response, I shared with Dave Galatians 2:16 that says that we are justified/saved by faith in Jesus not by our works and that Romans 8:1 says there is now no condemnation to those who are in Christ Jesus. I explained that when we are saved through faith that our sins will not bring condemnation of spiritual death because our sins are taken away by Jesus’ shed blood on the cross. I then showed him Ephesians 1:7, which says that in Him we have redemption through his blood, the forgiveness of sins, according to the riches of his grace. Then, I went to Ephesians 2:8,9 and explained that we are saved by grace THROUGH faith and not by anything we can do, that it is a gift of God. 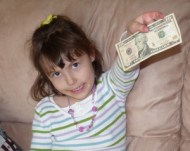 I went on to explain that it is God who gives us the faith and it is God who saves us. I told Dave that I didn’t think he was an atheist because it didn’t sound like he didn’t believe there was a God but just he didn’t know who God is and what God was about. I said that the reason he was so confused was his unbelief and that if he wanted answers he should pray to God to remove his unbelief and give him the faith to believe. Dave was a very easy person to talk to and thanked me for my time. Although he might not admit it I believe Dave is searching for the truth. 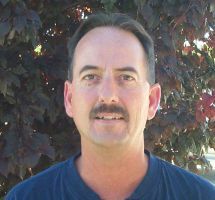 We continue to run into more and more ex-Mormons who have left the LDS Church or in the process of leaving but are confused and lost due to disappointment from the lies of the LDS Church. Please be in prayer for all these lost people.